When you buy a Nespresso machine you aren’t just buying the machine, you’re also buying the Nespresso capsule experience. Welcome to The Coffee Maven’s Complete Buyer’s Guide. 3.2 What Is a Nespresso Boutique? What’s the difference between Nespresso VertuoLine and OriginalLine machines? For more detail, check out our complete Nespresso VertuoLine vs Original comparison. Generally, you don’t choose to go with a pod coffee system to be more cost effective. Most other forms of brewing coffee — drip coffee makers, french press, Aeropress or standard pump espresso machines like those by Krups — will save you the most money in the long run. Still, pod coffee systems will save you money compared to buying a beverage at the coffee shop every day. The table below shows the average annual savings for Nespresso and Keurig coffee pods compared to a daily $4 coffee at your local coffee shop. Related: Nespresso vs Keurig: Who’s Comes Out on Top? What Is a Nespresso Boutique? If Keurig brewers are about convenience, Nespresso machines are about refinement. To that end Nespresso has developed their concept of “boutiques” where customers can browse and sample Nespresso’s wide array of available pods and buy capsules, machines and accessories. According to Nestle there are over 300 Nespresso boutiques around the world, and the company has 44 locations across the United States as of this writing. Some are full retail locations, some have cafes and still some are just kiosks. Use Nespresso’s boutique locator to find the one nearest you. Nespresso brand capsules aren’t the only game in town. You can save upwards of $0.40 per serving by choosing a third party pod such as those from the following retailers. None of the following Nespresso alternatives are endorsed or sponsored by Nespresso and are only compatible with OriginalLine machines. Click on the companies in the table below to be taken to another page with more detailed information. Even if you go with the non-Nespresso capsule manufacturers above, there’s still no cost-saving substitute to using your own ground coffee. Keurig offers the My K-Cup, where users can refill a pod with their own home ground or pre-ground coffee for a fraction of the price. Nespresso machines offer similar alternatives. The closest comparison to Keurig’s My K-Cup are the reusable, refillable Nespresso capsules available on Amazon. You weigh out the good and bad for yourself, but I’d suggest giving them a try. VertuoLine machine users can try this “Make Your Own” reusable capsule kit. I’ve never used it but it’s highly rated on Amazon. 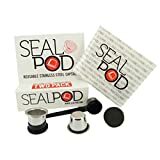 Identical in concept to the cheap resealable pods above, you can also try a premium product: Sealpod’s Stainless Steel reusable pod for OriginalLine machines. You only get 2 stainless steel pods for a ~$40 investment, but it’s a better performing product for sure. They also offer a 5-pod package for a heftier price tag but a lower per-pod investment. The package also comes with 100 foil lids to reseal the stainless steel pods, and you can buy more for about $0.12 per foil. VertuoLine machine owners — there’s hope! 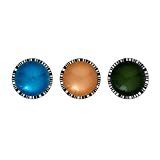 My-Cap is a company that makes VertuoLine compatible reusable filters and foils for pods you have already used. That’s right. This isn’t a reusable pod that you fill with your choice of coffee. It requires you already to have used a VertuoLine capsule, which you then refill and reseal for multiple uses. And the company suggests immediate use, so don’t refill and store for future use. These capsules really do work, and they have the reviews to prove it. If you’re a VertuoLine user looking to cut back on cost — and at over $1.00 per capsule that’s understandable — this is pretty much your only option. Thankfully, it’s a good one. Single serve coffee has been a boon to coffee drinkers seeking convenience but has had significantly negative impacts to the environment. In fact, an article by The Atlantic claim that used Keurig pods buried in 2014 would circle the Earth 12 times! And that’s just for Keurig pods. Bad press and a push by consumers have single serve coffee manufacturers searching for answers. In that same article by The Atlantic they state Keurig will be ready to unveil a recyclable single serve pod by 2020. While great, that doesn’t solve the problem now. The best solution is to avoid buying single serve pods or capsules and to instead purchase the reusable pods above. The benefits? Don’t be a lazy person. Jump in with reusable pods from Day 1. Of course, if you do want to be lazy — or maybe if you’ve just found that oh-so-perfect pod that makes your day that much better (who am I to judge?) — you can sleep well knowing Nespresso is a leader in single serve recycling efforts. Nespresso has possibly the best pod recycling program in existence with the stated goal of recycling 75% of all capsules sold. They allow customers to collect all spent capsules in specially designed recycling bags, which can be returned to any Nespresso boutique for collection. Compatible retail partners include Sur La Table and Williams-Sonoma. You can click here to find a participating location near you. Ask away below, or chime in with your Nespresso capsule experience! I’m sooo glad I found you on the web, just opened my new Inissia last night! I’m fascinated, love it and so want to learn more. I can’t wait to read your info. Thanks a lot for reading, Larry! Thank you for the information here. Regarding your savings chart, it appears to be a little inaccurate. You state that a single serving from a coffee shop is $3.50-$4.50 which is untrue. When I go to Starbucks, a Grande Americano (which is actually 3 shots of espresso is $3.30)…so overall the savings for using the pods are much lower than advertised here in your chart. It would take 3 pods to = 1 Grande Americano which would be around $2.25 per beverage. Aside from that, thank you so much for all the information. This is extremely detailed as I am always looking to try some different pods here and there to see if I can find some better flavors. Thanks for commenting! While I’ve never ordered that drink specifically, I do know a grande latte where I live is around $4.25. And a long black coffee is around the same. That said, I do live in a city setting. 🙂 Thanks for providing some additional context! A Venti black coffee at nearly all Starbucks in Tampa, FL are $2.35… I would agree that at many, if not most, locations in the US your calculations may be exaggerated. Are k cup pods compatible with Nespresso machine? The house we are vacationing in has Nespresso machine. I have k cups. I’m sorry, they are not compatible. I have found that walmart has the cheapest nespresso pods available at 31 cents a piece. Can I buy Alto capsules from third party sellers? I know I can buy them from Nespresso. Hi. I just want to make the point that many of us don’t give a flying F about recycling and are tired of having the garbage police whining about it all of the time. Otherwise good article. Attitudes like this are not attractive, only a vain, selfish person cares not about leaving this earth in the same if not better shape then when they came into it. AMEN Mike and thank you! I don’t think you can compare the price of a coffee from a cafe to home brewed anything. I am paying for the employee(s) preparing my coffee, the expensive equipment and the cafe experience. I think Nespresso is too expensive for what you get and the fact that I have to make a special trip to their “boutique” or order online is too much work. I believe the consumer will wise up and abandon them eventually or something better will come along.